In this Crash Course, we will help you understand the importance of having goals and help you create BRILLIANT goals for yourself and your organization. 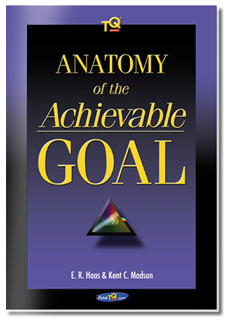 You will have WRITTEN goals for each key area of your life... out 1, 5, 10, even 15 years into the future. Give us your attention for just 30 days and you will not only understand the Power of Setting Achievable Goals, you will discover how to use this skill for the rest of your life. * This item included in the full TQ System. Take Today's TQ with you! Download your monthly day-planner pages now! A made-to-order, 172 page book containing a personalized, 100 point performance assessment and eye-opening evaluation — guaranteed to fast-track your career, and your life. The Power of TQ is for people who know they can do better... want to do better... and are committed to producing superior results. Our advanced tools and technology make it quick and easy, immediately transforming your performance from ordinary to extrordinary. Guaranteed. By writing down a task, project, wish or goal, you don't have to worry about forgetting it. Put everything that you want or need to get done on your Master List. Maximum personal productivity is entirely dependent upon how quickly you can go from a concept to a completion. To be as productive as possible, you must have an organized system for keeping track of all data, dates, numbers, people, goals, plans and to-do's. You need a single system that helps plan this entire flow of detail -- from idea to implementation to completion in the least amount of time -- without losing anything through the cracks -- or driving you crazy in the process. Write down everything regardless of how small in one location -- your Master List -- today. Today's Idea For Action is from the TQ Make Plans Color: Make Planning a Routine Part of Each Day. Print this page. Get out a pen. Better, Sign In and Answer Online. Sign In to Go Interactive! Is your Master List close at hand? Where? What happens to your schedule when you must digress to something you'd forgotten? Have you left anything out of your Master List today? So, Just How Committed to High Achievement Are You? Think about it. How well and how often do you actually do Make Plans Factor 5F? (Make Planning a Routine Part of Each Day.) No question, this is a major driver of personal and professional success. A high commitment (5F rated 8 or better) suggests you're highly organized and very productive. You're a master at checking off tasks, one-by-one, and never lose track of important details. You have instant access to all the dates and details in your immediate future, and a single list that contains all the things you want to get done. Your calendar provides a clear view of short and long-term goals. Each morning begins with a careful review and a systematic selection of the items you will complete that day. Each day ends with the satisfaction that a multitude of tasks have been successfully completed and major progress has been made overall. A lack of commitment suggests there's "no method to your madness." Your list of things to do is often chaotic, disorganized and rarely complete. Notes and reminders tend to be scattered everywhere, and you have to check for appointments in two or three different places. With no comprehensive process in place, you lack both the far-sighted vision of what you want to get done, and the near-sighted view of what needs to be done now. Each day is somewhere between busy and frantic -- and you wonder if you're really making any progress at all. What happens when you do TQ Factor 5F more frequently? You have more power. You have a simple, yet thorough, system for planning all your projects and tasks. You accumulate performance positives like "Methodical, Competent and Systematic" -- immediately moving you towards the results you expect. What happens when you fail to consistently do TQ Factor 5F? You have less power. Things get lost, misplaced, delayed and forgotten -- most of the time. Negatives like "Inconsistent, Chaotic and Scattered" start to take their toll on your performance -- quickly moving you away from the success you want. a Life that Matters.Now On Sale. To get the most from your subscription to Today's TQ, be sure to take advantage of our expanded services, online tests, and other performance resources. Reinvent yourself by testing your TQ. Discover what you are doing RIGHT, what you are doing WRONG and exactly what you need to do DIFFERENT. Reinforce those commitments by listening to your Workshop CDs and placing your Signs for Success. Review our online performance commentaries. They just might change your life. Getting your Daily Lessons In Excellence is a vital step towards exceptional personal performance. Today's TQ keeps you connected to your dreams and goals, and committed to your performance. Forward this Today's TQ to a friend. Want the printer-friendly version? Just print the page! Get the RSS newsfeed version of Today's TQ. FREE content! Put Today's TQ on your site. Get Today's TQ, our $120 daily training program, FREE and delivered to you each day just for registering now. Today's TQ for the week of April 21 - April 27. What Does Your Pot Of Gold Feel Like? Are Any Of Your Projects Losing Steam? Are You On An Energy Roller Coaster? How Did It Ever End Up Like This? Do You Pay Enough Attention To Your Own Schedule? Not a member of ThinkTQ.com? Register now and gain access to our site, our testing and evaluation tools, and to our highly advanced, highly targeted TQ training systems. This $160 TQ Starter Package includes your Daily Lessons in Intentional Excellence as well as a TQ Workshop of your choice -- FREE! You will also receive the best book on Time Management ever written, Revelations of The Time Prism: Full Spectrum Time Management... as an instant download... absolutely FREE! Remember, any information you enter anywhere on ThinkTQ.com is 100% private, and will not be given, sold or rented to others. There is no requirement that you purchase anything. There are no reoccurring charges ever. You may cancel anytime and we will part friends. If you have an optional six digit referral code number please enter it here.